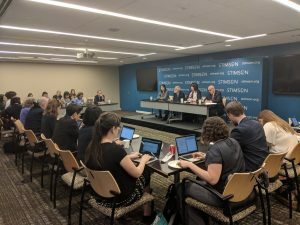 This is a transcript of the 38 North Press Briefing at the Stimson Center on June 4, 2018 entitled “The Singapore Summit: What’s A Good Outcome?” Moderated by Yuki Tatsumi, co-director of the Stimson Center’s East Asia Program, it featured Ambassador Robert Gallucci, Suzanne DiMaggio of the New America Foundation, and Joel Wit. Find archived press briefings here. MS. TATSUMI: Okay, good afternoon. My name is Yuki Tatsumi. I’m a Co-Director of the East Asia Program here at Stimson Center. Welcome to the 38 North press briefing, in the anticipation of President Trump’s and Kim Jong Un’s upcoming summit. As far as we know, the summit is still on, back on. We have three wonderful speakers here with us today. Ambassador Bob Gallucci, Ms. Suzanne DiMaggio, and Mr. Joel Wit. I don’t think any of these folks needs any introduction, so I’ll get right in. What we would do is we will first turn to Suzanne for her initial comments and then Bob and then we’ll wrap up with Joel. And then, the remainder of the time, we’ll try to take as many questions as we can cram in between now and 1:30. So, without further ado, Suzanne, please? MS. DIMAGGIO: Thank you, Yuki. Let me first begin by thanking Stimson and 38 North for hosting this. I don’t think the timing could be better – (light laugh) – now that the summit is back on. I think this is the first event since the – what do we call it? – “uncancelation” of the summit. MS. DIMAGGIO: So, let’s get through this next 90 minutes and hopefully we’ll still have a summit. So, I thought I would just briefly sketch out what I think the administration is getting right on North Korea and the summit, and what are the continuing issues. One list is longer than the other. The first is “What are they getting right?” So, I really think this is a big deal, and I don’t think they’re getting enough credit for the fact that the administration and the President have up-ended this whole notion that engagement with an adversary is a reward and it should be avoided at all costs. Instead, they’ve made it clear that meeting with an adversary, probably our greatest adversary at the moment, at least in the President’s mind, is not viewed as a concession. So, this is a welcome turn to diplomacy, to resolve the whole range of issues we have with Pyongyang. The second point, I think, that they’re getting right is just recently displayed on Friday. And that is showing flexibility. The reported immediate “all or nothing” approach by the administration seems to have been replaced by a more realistic approach. I think President Trump used the word “process” at least a dozen times, after he met with Kim Yong Choi. And then, Secretary Mattis, over the weekend, at the Shangri-La Dialogue, emphasized that this is going to be a bumpy road ahead. So, it seems, suddenly, the administration has a more realistic “take” on what diplomacy with North Korea entails. And I think that’s a positive thing. Now, there are a number of continuing issues. I think there are still mixed messages coming from the administration, and this administration has been plagued by this since day one. I think, for example, after meeting Kim Yong Choi, Trump suddenly announced that he’s finished with “maximum pressure” as a policy, and meanwhile Secretary Mattis, at the Shangri-La Dialogue, urged Seoul and Japan to keep up the pressure. So, this is obviously a contradiction and I think it confuses, especially, our allies. Which one is it? I think I actually agree with President Trump on this because I think the realization that “the train has left the station” on the “maximum pressure” approach, now, with China engaging regularly — with Kim Jong Un engaging regularly with Beijing and now we just saw Foreign Minister Lavrov in Pyongyang – and my understanding is that Kim Jong Un will go to Vladivostok in September. So, I think that pressure, “maximum pressure,” has been deflated and I think it’ll take a lot of effort to resuscitate, if there is ever a need to do that. And somewhat related, I think the coordination with our allies is still very problematic. (Laughs.) Moon has already expressed – President Moon – unease with President Trump’s approach to the summit itself, and then, I think, the cancelation without consulting with the South Koreans also caused some consternation. I think, frankly, they were just blind-sided, without any effort to notify or consult them on this decision. So, this is an on-going issue that I think will plague the administration, going forward. And then, another issue is the unnecessary drama – that’s the way I would put it. I think this whole drama of the cancelation of the summit could have been avoided. President Trump said, in his letter to Kim Jong Un, that canceling the summit was in response to a tough-worded statement from the North Korea. In particular, it was from Vice-Minister Choe Son Hui. Well, that statement was, of course, a response to remarks by National Security Adviser Bolton and Vice President Pence, advocating a Libya model approach to North Korea. And I think anyone who knows how the North Koreans operate fully expected that response. I think, when you threaten the North Koreans or expose a point of weakness, of course they’re going to hit back hard. And I think that approach, if anyone should appreciate it, it’s President Trump – (light laugh) – because he follows a similar approach. So, I think the preferable way of handling would have been to do it quietly, either directly, through the channels that exist, or through the South Koreans. But I think it just caused a lot of unnecessary theatrics that could have been avoided. And then, the other continuing issue and I think one that I’m worried about is when we get to Singapore on June 12th will President Trump be able to stay on script? I’m sure he is going to be given a short list of talking points. And I think the fear is that he might give away too much. I hope he’s taking the preparation seriously. (Light laugh.) “If Kim asks for this, say this.” I don’t know if he has the discipline – (light laugh) – to stick with that. I am particularly worried about if Mr. Kim raises the idea of withdrawing US troops from the Peninsula and suddenly President Trump says “Sure. We can do that.” Those are the kinds of things that are keeping me up at night these days. And then, just let me conclude by saying what I think is the best possible outcome for June 12. I think a general statement that identifies denuclearization as an end goal of a process to be determined appears to be the best possible outcome at this point and I think even that will be a challenge to pin down. The major tradeoffs to the North Koreans seem to be a peace agreement, normalization of relations, or at least a path to that, security guarantees and sanctions relief. How both sides define denuclearization is still unclear. I think Che Song Wi, on the North Korean side, and Song Kim on our side, are working on these issues. My understanding is they held their fifth meeting today, at the DMZ. So it’s clear they’re working on these details. But I think Trump’s movement away from insisting on an immediate all-in-one, front-loaded, deal, versus the North Koreans holding fast to an action-for-action approach stretched over a longer time horizon, is where we’re at now. And it seems maybe they’re moving towards a compromise between the two positions, perhaps a phased approach over an accelerated timeline, if we could get there. Granted, detailed to be worked out. But I think, if we can get to that point, then at least we’d have the basis of a workable starting point. MS. TATSUMI: Thank you, Suzanne. Bob? AMB. GALLUCCI: I thank the Stimson Center and thank you all for coming. There’s nothing funny about nuclear war or nuclear weapons, but there is something funny about the way we are addressing all this. I mean, I thought it could not get more bizarre, and then yesterday morning I was doing a media thing and, just before going on, I learned what I think is true, which is that Assad is going to Pyongyang. I’m sorry, but this is weird. It just struck me as just a situation that could not get more strange, in which we have the President come out and say what many of us, as graduate students, would have wanted to say, which is talk about the reading through the first half of the seminar and what was in the reading and then admit in the second half that we hadn’t done the reading! I mean, just keep rolling right on. It is so hard, I think, to avoid “shiny objects,” for you all, and to focus on substance. And I’m not about to do that, necessarily, but I think it would be good, to the extent we could, that we tried not to look at all – I mean, as Suzanne said, did we have to go through “There will be no summit,” as he’s sending off a team to prepare the hotel rooms? Just – it’s hard not to look at the setting, which has been nothing short of bizarre. I mean, I just would point out that it was North Korea, with Syria, where the transfer issue of a nuclear reactor came up. The Israelis used their version of a nonproliferation policy – crushed that reactor! – without much of anybody saying anything. Right? This is presumably the same Assad who would be going, now, to North Korea. This is – if we’re going to complain about something rather than an insult to one of our officials, we might complain about that. But, I’ll leave that. So, some obvious things, but I think worth noting, is that June, 2018 is better than June, 2017, that we lived through a year of being what seemed to me hours to days against a possible second Korean War, started, quite plausibly, by some North Korean provocation, as the Foreign Minister said at the UN, “Maybe we would splash down some missiles around Guam, maybe we would test a nuclear or thermonuclear weapon in the atmosphere.” And then what would the United States do? Presumably “something.” And then what would the North Koreans do? Presumably “something.” And then we are in the scenario of a possible huge conventional confrontation on the Peninsula. So, we lived with that for a year and we’re not there now, as the President has pointed out a number of times, “Can’t you see how well we’re doing?” And what I wanted to point out is yes, let’s note that. I think it’s good to note that we are not in as bad – we’re not as close to the edge of a cliff as we seemed to be, at least, for a year or so! The second point, that relates to this, is that we are not, at least in part, because there’s something of a de facto moratorium on testing of nuclear explosive devices and, at least longrange ballistic missiles, by the DPRK. That’s also good news. Right? Now, the other side of that coin is if we embrace that with too much enthusiasm, and that becomes the standard for success, in my view we will be making a mistake, that we should not legitimize the North Korean capability by accepting the status quo as a situation in which we can then proceed to normalization of relations with this country, that has nuclear weapons and ICBMs. So, we want to be happy about the no test environment we’re in, but we have to understand that “it would not be prudent,” as they say, to embrace that as an acceptable durable standard. A third point here is, as Suzanne pointed out, is the question of substance, and the non-shiny objects here, that I think it’s worth noting, and I think Joel is going to expand on this, I’ll note, that what denuclearization means – and that’s at the heart here, I think. If the President of the United States ultimately, out of this engagement – and I don’t mean just June 12th – gets what most of us in this room, I imagine, think denuclearization means, if he doesn’t get anything else, that would be a win. And if he gets everything else but doesn’t get that, that’ll be a loss. So it’s worth focusing on exactly what that means. That means not only the removal – not just dismantlement, but removal – of the nuclear weapons and its components, from the DPRK, from North Korea, of all fissile material from North Korea, of the production capacity for that fissile material – and when we talk about uranium, also enriched uranium, because of all we’ve learned about how easy it is to go from three percent to 90 percent, as opposed to go from .7 percent to three percent. So, we want no enrichment, we want no reprocessing, so we want no fissile material production capability, no nuclear weapons. We’ve also got to understand what’s “physically” possible when we say that, physically possible to verify. If the North Koreans say – presumably they start with a declaration, “We have 25 nuclear weapons, we have 30 nuclear weapons.” If they say “30 nuclear weapons,” it will be virtually impossible to exclude the possibility that they have 35. Right? Could we exclude the possibility that they have 135? Yes! By an estimate of how much fissile material they could produce. So, all I’m telling you here, generally at this point, is I think getting serious about denuclearization and what it means, and what it means to monitor the process, and what it means to verify the commitment, “Who does it? What entities? Is it the IAEA? Is it an ad hoc entity like UNSCOM or UNMOVIC? Is it a combination?” These things are interesting and important. And over what time period? The third thing here is that the President has, thankfully, talked about an on-going process. As Suzanne pointed out, that word “process” figured prominently. (Light laugh.) And that’s good, because it moves us away from a “big bang theory” of everything happening all at once. And those of us who have been involved in negotiations know everything doesn’t happen all at once. It’s going to happen over a period of time. And the second thing is it’s highly unlikely that they do everything and we do nothing, during this period of time. (Light laugh.) Whether it’s “action for action” or phased or whatever, that there’s going to be some sort of give and take, quid pro quo, going on. All right. What does that look like? And then, another little detail here, if, on the other side, if the theory of North Korea giving up their nuclear weapons capability, as well as their program, if this, for those of you and those of us who believe that’s even remotely plausible, if the theory is they will do it only if their security concerns are met – you can’t buy it – I mean, money will always help, and resources – but fundamentally it’s a security issue. You, and the North Koreans, have observed that US policy can change dramatically – (light laugh) – from an Obama administration to a Trump administration, and deals that are made, commitments that are made by the President, are unmade by the next President. So, he has created this backdrop. I know people say “Well, North Korea doesn’t care about Iran.” I am absolutely certain the North Koreans noticed – (light laugh) – what happened. When I delivered, many years ago, a presidential commitment to provide those light water reactors, if for some reason the consortium of KEDO didn’t, Kan Suk Ju, my opposite number, the Vice Foreign Minister, said “That’s just a commitment from the President. Where’s the Congress’ commitment?” They are very keenly aware of the differences in commitments, and they will be, and still are. So, it’s worth thinking about what it is we do, the United States does, in order to provide the kind of assurance that even is remotely likely to replace the deterrence that they think they get by nuclear weapons mated with ballistic missiles that can attack the continental United States. Economic and political benefits? I think it’s worth thinking about also, as one of those details. The President pointed – and you saw him – I think he actually pointed in the direction of where he thought Japan was, and where he thought South Korea was – and there’s precedent for this. I mean, if you go back to the Agreed Framework, the delivery of everything but the heavy fuel oil was South Korean or South Korea plus Japan, for those light water reactors. So there’s precedent for that, but we have to think of what’s in there. I would also add, very quickly here, and wrap my remarks up, by saying that among the things that I think are missing here, and I’m hoping and praying are not missing from the calculations of this administration, is what exact role we plan for the ROK, for the R-O-K. What’s at stake, if we get the summit wrong or we get the follow-on thing wrong, is not only the security arrangements and the threat from North Korea, but the alliance, because I know, in this room, you all know, that President Moon’s position is an enormously popular one because it’s a position that “seems” to put aside a threat South Koreans lived with last year, that there would be a second Korean War, brought to them by the President of the United States. That seems like it’s been diminished as a possibility, significantly, by President Moon and his diplomacy with the North and with the United States. So, I would just say I would hope that we have scripted and figured out, with our ally, what role they play, in which parts of this implementation process. Finally, human rights. The President was clear yesterday that no – (light laugh) – we didn’t talk about human rights. Actually, the day before yesterday. In the Oval Office. Okay. I’m not an expert on human rights, but one thing I think I know to be true is that the implementation of the Agreed Framework, 25 years ago, was materially limited. The degree to which we move towards the words that indicated normalization, back then, that movement was limited by the fact – the fact – of human rights abuses in the DPRK, and that somehow, at some point, if we truly mean we’re going to have a normal relationship with Pyongyang, diplomatic relations and everything else, something’s got to happen on the North side, with respect to human rights. At some point. I’m not trying to make this any harder than it is, going beyond nuclear weapons. I haven’t mentioned chemical weapons, biological weapons, which some in the administration have – also, I think, want to cure cancer with this deal at some point – but you’ve got to figure out what you really, really need, and I’ve said I think the nuclear thing is at the heart, ballistic missiles are very close to the heart, and then, as you move out, I’m also saying that, eventually, for normalization to work, you’re going to have to deal with the human rights issue. MS. TATSUMI: Thank you, Bob. Joel? MR. WIT: And I think you said to him, “There’s only one person who lives in the White House. MR. WIT: So, it’s interesting you brought that up. I’m just going to make a few sort of disparate points here. The first is that I think this has died down somewhat, but everyone under-estimates the momentum behind what North Korea is doing on their side. This isn’t a “charm offensive,” this isn’t a tactical – some sort of tactical trick. There is enormous momentum in Pyongyang behind what they’re doing. And, you know, we can argue why. I personally don’t think it’s because of sanctions. That may have played a small role. But it’s something they decided internally and it has to do with the size of their nuclear arsenal, the missiles, the desire for modernization of their economy. All of these different issues have sort of come together at this moment. And I think what you need to do, also, is pay attention to what the North Koreans are saying. You know, in Kim Jong Un’s meeting with the Russian Foreign Minister, he used a formulation which is very interesting, and I think you’re going to see it quite often. And I’m going to quote it. It’s “finding a solution to meet the interests of each other, through a new method, in a new era, and under a new situation.” It’s not just propaganda. He doesn’t just say things. This is a new formulation that’s very important. There is a lot of momentum here, and I think it’s going to keep carrying us, beyond the summit, into the future. A second point. On denuclearization and what does that mean, you know, there are a lot of different ideas out there and, of course, we all know the process, what it should include, and I’m going to talk about that in a minute. But there’s another issue here, which I don’t think has gotten any attention, and that is that because this is going to be so difficult, how do we deal with that? Do we do it through sort of a “big bang theory,” the sort of Libya model? Which we’re not going to do; it’s not going to work. Or are we going to get inventive – and not just have some sort of arms reduction process, but combine it with other things that have done in the past? And by that I mean look at the cooperative threat reduction programs that have been done with Russia, with Ukraine, with Kazakhstan, with Belarus, with Iraq, with Libya. Cooperative threat reduction are programs that help you achieve your objectives, in terms of getting rid of the threat, that allow you have an on-site presence to monitor what’s going on, but also there’s something in it for the host country in terms of economic benefits. And I could give you some examples. I don’t want to go into great detail. One example, very quickly, is what do you do with North Korean scientists? There have been reports that they’re going to be shipped out of the country, all 10,000 of them. Well, I doubt it. So, what do you do with these guys? And the answer is, in cooperative threat reduction, scientists were given civilian jobs to do. They came up with ideas for doing civilian projects that would help the economy. That’s what’s going to be needed in North Korea. And there are a number of other areas. So, we need to be thinking inventively about this. And it’s going to be difficult, but we need to be thinking about some new approaches here. Well, yes and no. Yes, of course, it’s only logical to think that North Korea would have some problems with a lot of on-site inspections, just as any other country would have problems. I worked on US-Soviet arms control agreements. We were trying to get intrusive measures of verification in the Soviet Union. They had problems. And we had problems with it when they would propose real intrusive measures too. So, that’s going to be an on-going process. But the point I want to make here is – or there are two points, that I hope you will think about, and it’s not like a news story right away. But, the first point is that the political environment affects a country’s willingness to accept those kinds of measures. If you’re enemies, obviously they won’t accept very much. If you’re becoming friends, it opens the door to accepting more. And that’s been our experience in North Korea, in implementing the Agreed Framework at least. That overall framework provided an umbrella for North Korea to provide more cooperation than any of us would have thought possible, back then. A second point is when people talk about verification, they make it sound like it’s got to be a hundred percent either we know or we don’t know. It has to be “iron clad.” There hasn’t been a verification regime ever, that was a hundred percent iron clad. And, for those of us who are older, we remember the US-Soviet arms control negotiations, where there were standards for verification. And we didn’t trust the Soviets any more than we trust the North Koreans, and actually their cheating could do more damage to us than the North Koreans, if they cheat. The standard back then, for Ronald Reagan and Jimmy Carter, they all had different buzzwords. There was effective verification, adequate verification. But the point was that we could discover cheating in a timely way, timely enough to avoid it hurting or threatening our national security. And that’s what we need to be thinking about here. With North Korea, [if] one day we wake up, five years from now, they have one nuclear weapon there, they got rid of 40, is that going to immediately affect our security or not? Are there ways of building into our defense posture or whatever else we’re doing, to deal with that? That’s something that we need to think about. Well, I know Bob. Obviously, Bob was there. I was there. That’s not what happened. Just because there’s a process established doesn’t mean that’s a bad thing. Just because it doesn’t happen overnight doesn’t mean that’s a bad thing. And so, in the context of the Agreed Framework, our process, it basically destroyed their plutonium production program. I’ve said this a thousand times, and Bob has said it a thousand times. When we were in government in 1993, US intelligence estimates said that North Korea could have anywhere from 75 to a hundred nuclear weapons by the beginning of the next decade. If you fast forward to the beginning of the next decade, when the agreement collapsed, they had a handful, enough material for a handful of weapons, less than five. That agreement was slow moving but it decimated their program, at that point. They’ve come back. But those kinds of agreements, that are a process, that move by phases, so you can double check whether the other side is doing what you want them to do, those are good agreements, if you implement them properly. So, the idea that it has to happen overnight, even if it was practical – and it wouldn’t be acceptable – is just ridiculous. The last point and then I’ll stop, on the future of the alliance, which my colleagues have alluded to. There’s an issue here, which most people aren’t focused on. I’m just going to bring it up. It’s not immediately in front of us. But, if there is a process established at the summit – and part of that process is, of course, denuclearization. In part it is a process towards a peace treaty. What you will see, unless President Trump “gives away the store immediately,” what you will see are probably the beginning of conventional arms control and reduction talks, on the Korean Peninsula. This is, or has been at least, part of North Korean thinking, ascribed to me and others, a few years ago, that if there was this process, they would want conventional arms control talks. Fine. It served our interests. It does serve theirs too, because they want to switch resources to economic modernization. And this, of course, gets to the future of the alliance and the future of South Korea, in the alliance. So, it’s just something to keep in the back of your minds, that if this process move forward, alliance issues will become more and more important, and that’s going to require the US and South Korea, of course, to work closely to figure out what the future holds. I’m going to stop. Thank you. MS. TATSUMI: Great. Thank you all. I think we have just shy of an hour for the questions, so I’ll just open it up immediately to the floor. We’ll start from right there. Q Thanks for a great panel. Rachel Oswald, Congressional Quarterly. Before your event today there was a call with Senator Schumer and ______________ about what the Senate Democrats want to see on the cost for a nuclear deal. It seemed to me that they were staking out territory to the right of what President Trump is currently talking about. They talked about chemical weapons, biological weapons, and human rights to be part of the President’s deal. And they then take off the table the possibility of a North Korea version of the Iran Review Act, and they also said they wanted most of this action to happen before sanctions relief occurs. Given that some of the basic sanctions on North Korea are mandatory and have to be lifted by Congress, who problematic is it if Democrats, some Democrats, now are moving to the right of where President Trump seems to be? MS. TATSUMI: Who would like to take that one? MR. WIT: I’ll go. Do you want me to go first? MR. WIT: I’ll go first. MS. TATSUMI: Do you want to take the first one? Okay. A couple of points. The first point is I don’t think the North Koreans are going to “fall on their sword” on sanctions lifting right away. I know people think, “Gee, that’s why they’re doing this; they want to get sanctions lifted.” And I think, over time, that’s true. But I don’t think it’s an immediate priority for them. So, I don’t know how that fits into the congressional side of things, but it’s just not the thing they’re going to want right away. MR. WIT: — Democrats in opposition would criticize Republicans in power, for not engaging North Korea. And so now we’ve sort of got a little bit of role reversal, where Republicans in power are seriously engaging North Korea, and Democrats are staking out the sort of Republican view of the past. So, what I would say, quite frankly, is that this is an historic opportunity. That’s the first point. Whether President Trump pulls it off or not – I mean, we all know the dangers there. But it’s an historic opportunity and, in trying to pull it off, we need to be measured and careful about what our standards are for success. If you’re going to set a standard for success, in terms of an agreement that somehow deals with chemical and biological weapons, you’re not going to have a success, because they’re not going to be dealt with right away. They could be dealt with in the conventional arms reduction talks. Chemical weapons could be. But you need to be careful about your standards for success here. And I see that standard as just a prescription for failure. MS. DIMAGGIO: Can I add to that? MS. DIMAGGIO: Just quickly, I think when President Trump announced that he accepted the summit, I did get a few frantic calls from senators. (Light laugh.) Asking “How should we receive this news?” So it did put them in a bit of a dilemma, because, of course, they wanted to support the idea of diplomacy to resolve an issue that is bringing us to the brink of war. But, on the other hand, there was very little faith in whether or not President Trump had the patience, discipline, and expertise to pull this off. So, I’m a bit of two minds. I think, going forward, there’s no question we’re going to see Congress asserting itself in forging a big role on the North Korea issue, if we move into negotiations. They’re going to want greater oversight, especially given President Trump’s inclination to want to be unpredictable. And that’s maybe a good thing. But, on the other hand, I think the Democrats also have to be careful – and with November midterms coming up, we could see the face of the Congress change dramatically while these negotiations are underway. But, as I was saying, I think the Democrats’ message must be careful, because if they put in place a situation where the demands for a deal are outside the realm of possibility, then that would, I think, undermine their own position. On the issue of chemical and biological weapons, in my discussions with North Korean officials over the past two years, they have been very consistent on the idea of tackling these issues fairly early if negotiations were to come up quickly, not solving the issue but trying to find ways, at least, of not – providing assurances that they will not transfer chemical and biological weapons, which I think is a great worry for some people. So, I think that would be a logical start on how to tackle these issues, at first, is what assurances the North Koreans can give us that they will not transfer or sell chemical, biological, and nuclear materials to third parties, other countries, terrorist groups and so forth. MS. TATSUMI: Okay. Wait for the microphone, please. Thank you. Q Hi. I’m ______________ with The Guardian. What about an outcome in which they hold onto the arsenal they have and ________________ more arsenal but don’t test missiles, don’t test – no more nuclear tests – and don’t proliferate? Would that be a success? And what would the US give in return for that partial success? MS. TATSUMI: Who would like to take that? AMB. GALLUCCI: Probably all of us. But, I think I said before, and I’ll say it again, that we should be pleased that there seems to be a de facto moratorium. But, to accept that as a new status quo is to legitimize a North Korean nuclear weapons program, and I think that would be a mistake in terms of our own security, the security of our allies, in terms of the incentives for Seoul and Tokyo to remain non-nuclear-weapons states, for the whole regime of nonproliferation. It’s not good. So, it would be a mistake, in my view. MS. TATSUMI: Would anyone like to add? MS. DIMAGGIO: Just that I agree. I think, especially, we hear the North Koreans have told several interlocutors that they are agreeable to discussing denuclearization on the Korean Peninsula. Why would we go into negotiations with anything less than that in mind? I think that would be quite absurd, to back away from that just because it’s going to be hard. Yes, it’s going to be hard, and it’s unclear if we have the same definition. But, I think, at this stage of the game, to settle for a moratorium on testing would, in my estimation, be a big failure. I think what you’re describing is, basically, the Pakistan model, of where we are. And I don’t think that’s acceptable. Q Thank you. Barbara Usher from the BBC. Two questions. On the issue of denuclearization, can you tell us, from what you know, of speaking to North Koreans and from your own experience, what you think they probably mean by it? Is there anything you can say to shed light on where Kim Jong Un might be on that, in your own estimation, any of you? And secondly, you talked about the importance of Mr. Trump accepting a process, of being not so <inaudible>, more flexible, on the one hand. But also that he might give away everything. Nobody quite knows where he’s at. And then, on the other hand – on the other end of the spectrum – you have someone like John Bolton, who knows exactly where he’s at. How do you see this as a negotiating team strategy shaping up? I mean, if at all. How does that affect this historic opportunity, shall we say, on denuclearization? MS. TATSUMI: Joel will start? MR. WIT: At the risk of shameless self promotion, I had an article in The Atlantic, I guess it’s two weeks ago, on what North Koreans have said in private about denuclearization. And there’s nothing really shocking there, and Kim Jong Un has sort of said it in the meeting with the Russian Foreign Minister, phase by phase, steps by both sides during each phase, denuclearization but the end to US hostility, which means political, economic, and security hostility, and steps in each phase by both sides. At the end of the road, well, do troops from the United States have to leave the Peninsula? They fluctuate on that position. And obviously, recently, they’ve fluctuated again and said “Maybe not.” They see US troops as possibly a force for stability, which is code word for “Protecting us against China.” And there are other issues that came up too. But I think it’s pretty much clear what their view is on denuclearization. And that doesn’t mean it’s set in stone. They may have to revise it, but at least that’s their, sort of, going-in thinking. On the second issue, I don’t see John Bolton’s presence as part of some nefarious strategy; I think it’s just part of some poor planning, in terms of thinking about national security strategy. So, it could be a serious problem in the future. If President Trump goes to a summit, comes up with some phased agreement, John Bolton is still in place, and President Trump moves on to other issues, there is a lot of room for mischief there, for him. I would note that John Bolton, as far as I could tell, wasn’t at the meeting with the North Korean official, which is sort of strange. Q Yeah, what did you make of that? MS. DIMAGGIO: My view on Mr. Bolton in this context is a little less benign than what Joel just described. (Light laugh.) Yes, it was poor planning. There is a benefit to what we would call “a team of rivals.” But I think this is taking it to a degree that’s just unproductive. And, as we’ve seen with Mr. Bolton, raising the Libyan model over and over again was not subtle at all. I mean, he clearly meant it to derail the process. And Mr. Bolton is an old hand at this. He knows the North Korean playbook quite well. And I think it was a deliberate effort to “push the North Koreans’ buttons” and threaten them. So, what Joel said, I also didn’t see Mr. Bolton at this meeting with Kim Yong Choi, and it is strange not to have your National Security Adviser – (light laugh) – in the Oval Office with you when you’re meeting with such a gentleman. So, I would say, right now, Secretary Pompeo is leading the process, and obviously has had direct meetings with Kim Jong Un. And I think, as long as things keep moving forward, as long as Secretary Pompeo can continue to deliver in a way that President Trump is satisfied, I think he will continue in that role. But I think this is something the North Koreans are probably aware of, that if things do start to go sour, if progress isn’t made, if they’re not seen as moving forward in a way that seems sincere, then we have Mr. Bolton looming in the background, ready to jump in. And we know his plans. He’s written about it in multiple papers, probably some of them here. So, that’s the way I see his particular role in all this. MS. TATSUMI: The gentleman in the back? Can you wait for the microphone, please? Q Thank you. Gareth Porter, an independent investigative journalist. I wonder if the problem, at least in part, may be that North Korea will be leery of promises that might be made, in terms of security assurances, by the United States, as part of a deal. Would it be useful, from the point of view of both sides, to have a multilateral element of a final agreement, that would involve multiple, or multilateral I should say, security assurances to North Korea, by the United States, Russia and China? And is it possible that the North Koreans have already discussed that with both China and Russia in recent weeks? MS. TATSUMI: Who would like to start on that? MS. DIMAGGIO: I’ll take the first shot. I think, in a normal world, what you say makes perfect sense. But, just a few weeks ago, President Trump withdrew, violated, the JCPOA, the Iran nuclear deal. That was a multilateral agreement. (Laughs.) P5 Plus One. It also, by the way, was enshrined in a UN Security Council resolution. But that didn’t matter; the US still withdrew. So, I think, under normal circumstances, we would think that that was a positive thing. And, in fact, in one conversation I had with the North Koreans, we did bring this up. This was at the point when they still were insisting that they only wanted to speak to the United States about these issues. That was over the summer, last summer. And they did not seem, necessarily, interested in the multilateral aspect. But I suspect that that point of view has changed, as we’ve seen the outreach, first to South Korea, and then Mr. Xi and so forth. So — and I agree with Bob. In my conversations with the North Koreans, I would say almost every time we’ve met they’ve brought up the Iran deal and what is happening around that. They are watching and they have been taking notes. I think one of the things that’s so striking is that we withdrew from a deal where the other party was not cheating. I think that was quite striking for anyone observing, including the North Koreans. MR. WIT: I wanted to add just two very quick points. MR. WIT: The first point is if you asked a North Korean “How about a security assurance? And here’s a piece of paper that assures you of your security,” they’ll just laugh at you. And people say “Well, we’ve given them security assurances.” But none of them, obviously, have been worth the paper they’ve been written on. So, this gets to the bigger point of ending hostile policies. That’s their security assurance. If the countries are embedded in this process of gradual normalization, that’s the security assurance that would, I think, serve their purposes. Secondly, on this idea of bilateral versus multilateral, maybe I’ve been talking to these guys for too long, but they seem to go back and forth. Sometimes they want to do bilateral, just with the United States. Other times they’re kind of leery of just working with the United States, they want to go multilateral. And today, of course, I’m not sure where they are, because neither one of those may seem that satisfying for them. So, it will be interesting to see how that sort of shapes up, in the talks, as they take place. Q Than (?) Perlman, School for Conflict Analysis and Resolution, at George Mason. I mean, I guess on the last point is I imagine that the parties are going to increase their cooperation with other parties besides the United States, so it will be something minus one. So, one of the students mentioned that somebody had an idea: Since we’re not going to remove US troops from South Korea, maybe they’ll have Russian troops in North Korea. So, that was kind of an “inside the box” and “outside the box,” at the same time. But my comment is, I guess now <inaudible> in the room that’s not really even being seen is the fact that the North hasn’t complied with Article Six, and that we maintain our right to possess our nuclear weapons and demanding that other people give up theirs, and how that is perceived, which I call “nuclear narcissism,” that our nukes are okay and your nukes aren’t okay; we’re allowed to have – we need to have a deterrent but you don’t need to have a deterrent. And Joe Cirincione said it used to be the case that nuclear weapons were evil and had to be eliminated, but now nukes aren’t evil, but the possessors are evil. So, I’m just wondering what about this double standard, asymmetry? And also that parties are more – it’s more destabilizing to have, say, — that nuclear superiority is a problem, and inferiority is also a problem, and I think it’s been said a lot that Kim Jong Un is in a different place now because he has the deterrent, so he’s coming from a more comfortable position to negotiate. Can you wait for the microphone? If you can. Thank you. Q Do any of you think that North Korea, or that Kim Jong Un, has come to the belief that he knows he needs to give up nuclear weapons? Q Well, I think it’s sort of the conventional wisdom that you hear – I cover the White House and not international and foreign policy issues, but what I hear all the time is that he feels that his regime depends on the possession of nuclear weapons, that he gets recognition and importance for possessing nukes. And I heard a longtime CIA analyst on North Korea say on Mike Morales’ podcast – I was surprised to hear him say – “No, I actually think he knows he needs to give up these weapons, the time has come, he’s never going to have a functioning economy.” He was the only person who I have heard say this. And I guess I’m curious that do you guys think that Kim knows he’s actually got to make a deal and begin to get rid of these things? MR. WIT: Two points. The first point, yes, we often hear that, without nuclear weapons, Kim Jong Un couldn’t stay in power. Sorry, but haven’t they been in power before they had nuclear weapons? I mean, his father, his grandfather. The sources of power in North Korea, the sources of legitimacy, are not nuclear weapons. They’re much deeper and broader. And, if you go to North Korea, you get a good picture of that, by talking to people. Certainly, the weapons are important in terms of dealing with external security threats. But you saw recently how they sort of make a U-turn. Right? After years of extolling these technological advances, they said “Okay, we’ve accomplished what we needed to. Now we’re going in a different direction.” That’s the kind of system it is. And I often laugh when people said, “Well, they put nuclear weapons in their constitution.” And it’s, like, this isn’t the United States we’re talking about; this is North Korea. They put it in; they can take it out. So, you know, all of that stuff, I just find sort of off the mark. Secondly, on your second issue, I think we’re back to the stage where it’s something of a bargaining chip. I don’t think he thinks that “Gee, I’ve got to give it up or I’m toast.” I don’t think he thinks that. I think it’s a bargaining chip now, and he’s going to see what kind of bargain he can get. And ideally it’ll let him keep nuclear weapons and build a much better economy. That’s his objective. But he’s going to see where this road takes him. MS. DIMAGGIO: I’ll just say something quick. I’m not sure if this is going to answer your question, but I don’t think we should expect to hear Kim Jong Un require that in order for him to agree to denuclearization we have to denuclearize. I think that’s probably – I think that’s what you’re getting at. Q That was it, yeah. MS. DIMAGGIO: I think what we’re hearing more is an insistence that we not bring in any nuclear assets, into the Peninsula. And also for military exercises. Which I think is actually a reasonable position, to begin with. And I think, if it was more along the lines of what you’ve described, then it wouldn’t be a serious position, because we know that’s not going to happen anytime soon. But I do think, “at the end of the day,” what we’re talking about and why I think “process” is the right word, is to get anywhere with the North Koreans – and they’re consistent – the hostile policy has to change, as Joel said. And there’s no agreement, no amount of words, that’s going to convince them. It’s going to be actions. And what it comes down to is “Are we prepared to change the nature of our relationship with North Korea? Are we prepared to show them that we won’t bring nuclear assets into the region, that we will tone down the exercises which we’ve done now, concrete ways to show them that we’re ready for a change? And I think that’s the only thing that’s really going to convince them, at this stage. It’s not going to be a nicely-worded agreement; it’s going to be action. MS. TATSUMI: You said you wanted too. AMB. GALLUCCI: Yeah. I’m confused by both of the questions, and also by the answers, which is not good. So, starting with – one of the questions is “What are the North Koreans thinking?” Is what you just asked, I think. Right? And we all ought to start with “We don’t know.” Right? We don’t know what they’re thinking. I offered, a little bit ago, that in this town people divided largely on the subject of North Korea over whether they thought the North Korean nuclear weapons program, born in the eighties or, some would say, in the seventies, was part of their grand strategy to unify the Peninsula under the use of force – by the use of force – if necessary, deter the United States’ intervention and execution of its alliance obligations. And then there are the other part of people in this town that see it as a deterrent for the North Koreans, to stop America attempting regime change. And the three of us here have been with North Koreans who have referred to the Iraqi experience, the Libya experience, and they don’t want to victims because they don’t have nuclear weapons, et cetera, et cetera. Right now, what this guy is thinking about this and what he plans to do, we do not know. I mean, I could take a whack at it, but rather than do that I’d prefer to say “Since we don’t know, we need to find out.” Right? We shouldn’t assume they’re not going to give up their nuclear weapons. We should test the proposition. We should find out what it is that would meet North Korean concerns, if it possible to meet ‘em. If they must always have nuclear weapons, to unify the Peninsula, under the use of force – (light laugh) – we aren’t going to meet those objectives for them. So, we have to find out. But I would say, right now, we don’t know the answer to your question. Right? Let me just say a couple other things. About, “Well, maybe we want to not have our nuclear assets somehow ‘in the face of’ North Koreans” – I want to be careful how I put this – we have to – there are no American nuclear weapons on the Peninsula. And, when we do our exercises, we have been – we fly B-1s which, for us, are not nuclear capable. And that annoys the North Koreans, for obvious reasons. They are strategic bombers. Right? But they are not nuclear capable. They’re also annoyed by South Korean announcements, or sometimes American announcements, that are practicing decapitation. You can imagine why they would rather we not do that, or say that, at least! So, there are things that we could easily do to adjust the exercises, in conjunction with the South Koreans, and there are things that would not be easy. To, in a way, denuclearize America’s presence in the Asia-Pacific region would be, if we maintained our interests and our posture in the region, impossible, in my view. We are going to be having “boomers” in the Pacific Ocean. We are going to have nuclear weapons deployed in the Pacific, in the way that’s consistent with what [is] our declaratory policy. So, there are things we can do easily and there are things we can’t do, even with effort, I don’t think, without fundamentally changing America’s definition of its strategic interests. With respect to American exceptionalism and its embrace of nuclear weapons – and if you read the most recent NPR you saw a full-blown statement of the wonderfulness of our nuclear weapons for most living things on the planet, including our own security. A stark contrast to that would be the “four horsemen’s” objections to nuclear weapons of some years ago, where these gentlemen, for whatever else they think about nuclear weapons, at least said, in more than one venue, that they thought the position of America as a nuclear weapon state indefinitely was not sustainable if we hoped to prevent the spread of nuclear weapons to more countries. That proposition is enough to get – it was enough to get – some people to believe we had to do more than we’ve done. I would note here that the reduction in the US arsenal from the height of the Cold War is greater than 90 percent. Right? It’s greater than 90 percent. It’s something like 94 percent of our nuclear weapons have been disassembled and taken apart. And, the Soviets and Russian nuclear weapons. Some of his under agreement, some of this unilaterally. So, you could argue – if you’re an Article Six aficionado – you could say there’s been a lot of serious arms control/disarmament that’s gone on. We still maintain – and I don’t think it’s crazy to maintain – that it makes a difference which countries have nuclear weapons. And we feel more comfortable with some countries than we do with other countries, and generally we feel less comfortable with more countries than we have now. Right? And we feel better if certain countries that have them now didn’t have them. Right? And that’s a judgment that goes to something other than just the physical properties of fission and thermonuclear weapons; it goes to the character of the state, and the security concerns. So, when you put all that together, for me at least, when I think about our national security, I don’t see a shortcut that is good for American security or international security that would have the United States, in some dramatic way, unilaterally reduce its nuclear weapons, in a dramatic way. But the last President before this one was asking a proper question, “Could we go down another third?” Below the New START levels. Now, we’re not having that discussion, but I think that would be a healthy question. And, as you start to think about lower nuclear weapons, you start to think about those countries building nuclear weapons. And the country that’s building them faster than any other country, right now, on our planet, is Pakistan. So, you’ve got to put all this together, “at the end of the day,” to be something, I think, other than just “judicial,” in terms of looking at the commitments within an NPT context. Q Hi. Paul Shrinkman from US News & World Report. Just following up on the John Bolton comment, are there any other actors, either domestically or abroad, countries or specific individuals, that you see having an interest in scuttling either the Kim-Trump summit or any tangible outcome that could come from that? And is there any likelihood that those countries or people are going to follow through on that? MS. DIMAGGIO: You mean like Senator Graham? (Laughs.) Something like that. MS. DIMAGGIO: I mean, what I’ve witnessed with the Russians is they have actually been advocating for this testing, this moratorium on testing, with the Chinese. They call it, actually, “the Russian-Chinese model,” although – (light laugh) – many people have been talking it for years. So, I think this is a process they wanted to see happen. But, let’s be clear. Whether it’s Moscow or Beijing or even Tokyo, our ally, everyone wants to see their agenda reflected in whatever outcomes are reached. No one wants to be “the odd man out,” and no one wants to have their interests undercut. And this is why my point about coordinating, not just with our allies but also with friends and partners, in this common goal, is so important. And when I see how the administration is handling that part – and this is multi-level diplomacy. Yes, it’s bilateral with the North Koreans, but also on the multilateral front, this is something I don’t think this administration does well. In fact, it seems to disdain it. So that worries me. And then, maybe if we’re not handling that well, if we’re not sensitive to other people’s agendas, could we see Moscow try to undermine certain aspects of this? It’s possible, if they feel that their interests are being threatened. So, this is something, I think – I’m not sure the administration “has their eye on the ball” on this. MR. WIT: Actually, that’s an interesting point, because if you think beyond the summit, and let’s say one of the outcomes of the summit is a negotiation, and let’s take it even further and say there’s going to have to be, maybe, a couple of multilateral negotiations, one on a peace treaty, maybe one, a nuclear – like, nuclear negotiation like the Six Party Talks – that’s going to require a lot of multilateral diplomacy. And, you know, past administrations haven’t been perfect at doing that. The Bush administration had some problems with that. I guess we were perfect, in the Clinton administration. AMB. GALLUCCI: That’s my recollection. MR. WIT: That’s my recollection too. But, it’s an important thing to think about. If you’re going to get into a negotiation and it’s going to have to have multilateral involvement, we have to step up our game, in terms of that kind of coordination. Q Hi. Rebecca Kheel from The Hill. Sort of related to what we were talking about with the Iran deal and also congressional oversight, there’s been some talk about whether a North Korean nuclear deal should be a treaty. What would be the benefits of having it be a treaty, and do you think that it’s necessary to do it that way? MS. DIMAGGIO: Well, I think, you know, one of the things that did end the Iran deal, let’s be frank, is the fact that every 90 days it had to be presented to the President – (light laugh) – to reconfirm, and this was something Congress insisted on. And I just think, with President Trump, “out of sight, out of mind” – (laughs) – is a better approach. But every time – every 30 days – when it came – 90 days, or 120 days, for the sanctions waivers – came on his desk – it just stirred up this crisis. So, it really varies, I think. Obviously, for President Obama, it wasn’t an issue. But, in my estimation, I mean, when was the last time the United States passed a treaty? MS. DIMAGGIO: And before then – I mean, I think, when I think about our Congress, I think we’re out of the business of treaties for a while. So, I’m not sure how realistic it is, at this stage of the game. And that’s, frankly, why President Obama pursued just doing it through a presidential order, because he knew it wouldn’t pass Congress. Depending on how things go in November, we may be at a similar place on any North Korea deal. MS. TATSUMI: Bob, do you have something to add? AMB. GALLUCCI: I vote treaty. AMB. GALLUCCI: I said I vote treaty. AMB. GALLUCCI: I vote treaty. I mean, we count. Sometimes we get it wrong. Apparently it’s possible to get it wrong twice, on the CTBT, with — on the number of months. (Laughs.) So, we may get it wrong. And I remember the discussion in the Clinton administration about whether the Agreed Framework would be a treaty or not. It was a very short discussion. AMB. GALLUCCI: (Laughs.) So – but if you could get a treaty, and assuming it’s a good one – so, you know, you’d want the agreement – you want it to be durable, you want the bump you get with the other side, if you’re really going to offer them a treaty. But if you can’t get it, then you’re back in this ballgame. Q Hi. Oren Dorrell from USA Today. So, when you say that this summit is an opportunity to test what the North Koreans are willing to do, what’s the outcome that should come out of the summit, that tells us what they’re willing to do? And when I hear “This is going to be a negotiation; it’s going to take some time,” how much time? MS. TATSUMI: Would anyone like to take a first stab? AMB. GALLUCCI: — yeah, “getting to know you.” Wonderful. So, that the summit not fail, that’s one of the outcomes we want. Right? In other words, that no one goes home early because of what the other side said or did. No “food fights.” That there’s generally an agreement to continue engagement. I would like to – other things we might want – in addition to a meet, greet, and continue engagement, I’d like a little more detail on key topics. And this is what we started our presentation with today. We all have ideas about what’s most important here, and we’d like to hear – we’d like some framing language that gives us some hope that we’re going to get the substantive outcomes that we want, over time. Right? That’s what I’d be looking for. I’d be looking for a joint communiqué, whatever the format is, some joint statement, that indicates they are really, indeed, thinking constructively about a process. I would like the process to have some structure. I would like there to be a joint implementation commission or something like that, and not just say “We’re going to have continued meetings.” Maybe even summits. I’d like a little more “flesh” on the implementation of language that is captured in a joint communiqué and gives us hope there’ll be a substantive outcome that reduces tensions on the Peninsula. That’s that. Over how much time would all this take? I mean, I know many of you must have seen Sig Hecker’s piece he jointly wrote with a 15-year timeframe for the denuclearization. The problem here is Sig knows too much, and that was reflected in his thinking through how long it could take to do some of this. But, I think if you thought in terms of the most important stuff taking more than months, taking actually some years – I don’t think necessarily 15, but taking a serious amount of time if it’s all going to be monitored, on the equipment side, the dismantlement, and then removal of particularly sensitive things, certainly the material and maybe other things, it’s very hard to see all that working out in less than a year. So, you’re talking about a few years for implementation here. And maybe you give Dr. Hecker his due here, that some of this is going to take a very long time. But okay, I think the bulk of it, of what we – “we” – generally mean by denuclearization, would be done, could be done, in a few years. That would be my guess. MS. DIMAGGIO: I think maybe I said this before you came in, but I said the best possible outcome I see for this summit is a general outline of an agreement that identifies denuclearization as the end goal of a process to be determined. And, for me, the best case scenario would be, at this point, for President Trump to step back – (laughs) – from the process and hand it over to the professional diplomats and negotiators to work out these details. I mean, certainly, codifying the suspension and testing would be a priority, I think. And maybe setting up liaison offices in Pyongyang and Washington would be a real demonstration of a commitment to this process, that could be done quite easily and, at the same time, have the practical point of solidifying the channels of communications as well. But I think where the rubber is going to hit the road is if we get to the point of moving on to freezing the program, because that’s going to require a verification process and inspectors “on the ground.” And I think this will be the first major tests. There will be many tests along the way, as Bob mentioned, in this process. But, for me, that’s going to be the first major test, is if the North Koreans agree to that, whether it’s the IAEA or another multilateral combination of inspectors coming in. And here is where I thought Sig Hecker’s and Bob Carlin’s work – the main takeaway, for me, was when I looked at that span of years – I think it was 25 years – of a program that they looked at, that the moments where the North Koreans’ progress on their nuclear program came to a slowdown or came to a halt, is when there were inspectors “on the ground” in North Korea. That was a clear takeaway. So, for me, when I think of what would be a big success coming out of the summit – it may not happen immediately, but – I think getting the inspectors back in has to be one of our top goals. MR. WIT: Just very briefly, I agree with everything that’s been said, and there are a couple of things to emphasize. I think the idea – Suzanne’s onto something – the idea of trying to establish a way of communicating better, as we move forward with implementing whatever’s agreed to at the summit, and particularly negotiations, honestly – I probably shouldn’t say this – I won’t say it. MR. WIT: You know, there are better – there are other ways of communicating besides calling up someone in New York or getting on the shuttle and going to New York. You can supplement that. You can think of ways of making that better. When Suzanne says “liaison offices,” I’m not sure if she meant “liaison offices,” which is diplomatic relations. But there may be other ways of actually establishing communication channels. For example, how many people know there was a hotline between the State Department and the North Korean Ministry of Foreign Affairs, in the 1990s? And it was tested once, but never used. So, you know, there are ideas out there for doing it, and it’s really important, because this – we need continuous back and forth. You can’t have periodic back and forth or interrupted back and forth when things are going well. It has to be continuous. And I think that’s something that people may not be focused on, that they should be focused on. MS. DIMAGGIO: And by “liaison office,” I meant actual US foreign service officers, “on the ground” in Pyongyang, not a fullscale embassy by any means, but maybe the first step towards that, and then have North Koreans here in Washington, in an office. That’s what I meant. MR. WIT: Yeah, and there are other examples of this. For example, when we had a big food aid program in North Korea, under the Bush administration, 2008, there were regional offices in North Korea, people to monitor the food aid. There were people in Pyongyang, Americans, some from the State Department, in Pyongyang, there to communicate back and forth. And it was the same during implementation of the Agreed Framework. There was an office in Pyongyang, to deal with some implementation issues. So, it’s possible, if you’re inventive, to think about ways of doing that. MS. TATSUMI: Okay. So, we have only a few more minutes left. So, the last question goes to you. Q Thank you. Hee Jung Yang from Radio Free Asia. I have a question about South Korean media reports that there was – the top three North Korean military officials were reshuffled. I would like to hear what is your take on this. MS. DIMAGGIO: I’m going to go with Bob’s answer. We just don’t know. (Laughs.) On this one. I mean, if I were to guess, is it Kim consolidating his power? Probably. Some people have said it was him – he’s worried about leaving the country, coming to Singapore, and he wanted to get rid of these three really bad dudes. Right? MS. DIMAGGIO: But the simple fact is we don’t know. If I was going to take a guess, I would say it’s the further consolidation of his power. And then, maybe, a reshuffling of a team to move to fulfill what he’s described as this “new strategic line,” moving to economic development. MR. WIT: Yeah. Yeah, it’s generational change. It may be that. I know there’s a lot of speculation that these guys are hardliners. And I don’t follow these people closely, but people I’ve talked to said we have no idea. MR. WIT: So, it’s just a lot of – that’s speculation. MS. TATSUMI: Great. Anybody else have last words that you want to register before we close? MS. TATSUMI: Okay. So, with that – with that pondering thoughts, thank you very much for joining us this afternoon. Thank you very much.